Description: Evergreen coniferous tree, grows up to 20 meters high. Lower part of the stem is scully and grey-brown, and upper part is orange and flaky. Leaves on mature trees are formed in pairs, glaucous and needle-like, they become darker or yellow green during winter. Cones are red at pollination. When they reach the full size, they are ovoid-conic. Flowering season lasts from May until June. 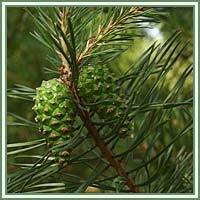 Medicinal use: Scots Pine has long been known as a medicinal plant. It is considered to be antirheumatic, antiseptic, diuretic and expectorant. Native Americans used it in treatments of lung infections. Even today, one of Scots Pine’s chief values are its effects on the respiratory system. Scots Pine is also valuable in treatment of kidney, bladder and rheumatic problems.Leaves and young shoots are very helpful in treatment of rheumatism and arthritis. Also, added to baths, they revitalise the whole body, helping in cases of fatigue, mental and emotional stress. 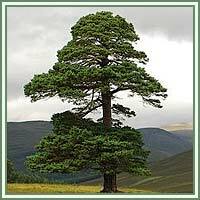 Scots Pine bath is also helpful in treatments of skin irritations. Essential oil made from the leaves is helpful in cases of asthma and bronchitis. Essential oil made from the seeds is a good diuretic. Safety: Wood saw dust and raisins could cause dermatitis. Some herbs could react with certain medication. Therefore, it is advisable to consult your doctor before consumption of any herb.